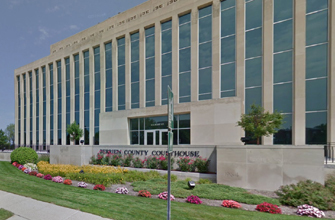 Updated: Police are investigating a shooting at the Berrien County Courthouse in St. Joseph, Michigan, on Monday afternoon that left three people dead, including the suspect. The gunman was identified as Larry Darnell Gordon, report the Associated Press and the Herald-Palladium. He was facing charges of criminal sexual conduct, assault with a dangerous weapon and kidnapping, the AP story reports. According to Bailey, Gordon took a gun from a deputy and began firing as he was being moved from a holding cell to the courtroom for a status conference. The slain bailiffs were identified as Joseph Zangaro and Ronald Kienzle. Both were former police officers. A sheriff’s deputy and a woman were also injured, the Washington Post reports. Both were shot in the arm. Michigan Gov. Rick Snyder announced Monday afternoon on Twitter that Michigan State Police had secured the scene and would be investigating.